Investing in people is what makes a successful matchmaker. If you’re a client or member here at Lisa Clampitt Matchmaking, this includes really diving in with you to find out all the things that make you special and unique. We access your past patterns, what’s been serving you (and what hasn’t! ), and create a concrete plan going forward to help you find your soulmate in less time and with our support every step of the way. It also means that, as a reader or someone following us closely, you are kept in the loop on the best date spots, my latest dating tips, and insights. When I started off as a matchmaker over 20 years ago, I noticed a trend in the industry of competition over collaboration. Other matchmakers didn’t want to share their databases, offer insights and potential matches for clients, come together to discuss trends, network, and communicate effectively. For me, it seemed like a missed opportunity. I realized that the more matchmakers and date coaches could come together, the more beneficial it was for everyone. That’s why I created The Matchmaking Institute. By training successful matchmakers, we have been able to create a community that grows from each other and helps build the very best matchmaking businesses – for over 15 years. Our faculty and advisors make sure that every student is learning and implementing the same code of ethics in the industry, with cutting-edge curriculum to successfully run a matchmaking business; effectively communicating with clients, and offering exceptional, personalized service. Plus, we hold yearly conferences and trainings to connect our matchmakers from around the world. And I’m serious when I say you won’t find this anywhere else because MMI is the only school in the world authorized to issue certification in matchmaking. We are licensed by the New York Department of Education meaning our teachers and curriculum have all been approved by the state. But, after dedicating 15 years of my life to connecting the industry, it has become time for me to take ownership of my leadership. After running all of our conferences and being part of every single decision at MMI, it’s easy to feel burnt out and exhausted from constantly working and looking for ways to improve, while running my own matchmaking business. That’s why, I really took the time to sit back and realize that we are connecting matchmakers on a global scale (matchmakers from 25+ countries and counting!) and that’s a mission worth fighting for. It has the power to transform the industry but I can’t continue to do it alone. This year, I decided to reach out to even more leaders in the industry to support me on the mission of transforming the way matchmaking is seen around the world. Asking them to show up to help this mission continue for the global good. 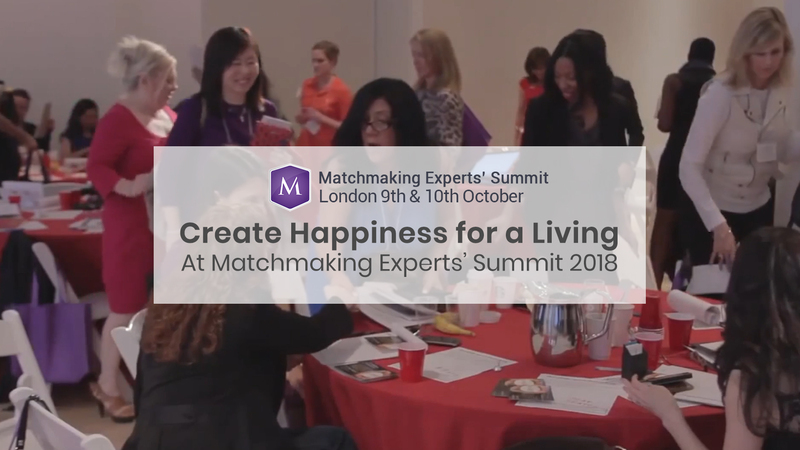 At our yearly Matchmaker’s Conference in London, The Master’s Summit will be bringing this vision together with some of the world’s leading matchmakers to visualize and create a plan for the coming year. We also are finally launching The MMLS which connects matchmakers with singles from around the world bringing the unprecedented opportunity for international collaboration. The MMLS will provide professional accountability across the industry and an international database of verified singles. If you want more information on The London Conference on October 8-10th, you can get all the information on speakers, agenda, and more right here. As a matchmaker, this directly helps me help you because we now have a global reach in order to match our clients. My passion to connect the industry directly helps you find the love of your life with an endless global database. Recently, I collaborated with another matchmaker using her database and successfully found a match for one of my clients. By expanding our reach and cross-matching, matchmakers are able to further monetize their Rolodex, as well as create even more happy marriages. For me, it’s all about collaboration over competition which directly helps you find the love of your life. When you work with us, our assessment process is incredibly thorough. After learning more about what you are looking for, we show you actual profiles and pictures of possible matches before deciding whether or not we are a good fit to work together. From there, we decide the best package for your needs together. (No money is exchanged until we are absolutely clear on the specific services). And by taking on only 12 clients at a time, you have a dedicated team constantly working for you. Because of this kind of service (with a global reach!) we have a 95% success rate. So, if you have been looking for love, we invite you to experience the difference. Check out our services for men and women now.